It is no surprise that a number of theropods changed to herbivory from carnivory at some point, or at least were probable omnivores. Theirizinosaurs are considered herbivorous, and the ornithomimids and oviraptorosaurs were probably omnivorous in the main with some species possibly being exclusive herbivores. What is surprising though is that Limusaurus is a ceratosaur and thus part of a clade which would normally not be associated with this kind of lifestyle at all – at least the others are consistent. Photo of the Limusaurus holotype. THe yellow arrows indicate a crocodilian in association. Ceratosaurs such as the eponymous Ceratosaurus, bizarre Carnotaurus and Abelisaurus while obviously having their differences do have one thing in common, namely being tanking great animal with shredding carnivorous teeth. Because, well, they killed and ate their dinner and it had a tendency towards a) being alive, and thus unlike plants, b) could run away. It is then very odd to find an herbivorous genus floating around among this bunch of carnivores, but why do we think it has gone down this route? Preserved gastroliths with a 1cm division scale bar - these are really small. Well, for a start Limusaurus doesn’t have carnivorous teeth – it has none at all. Instead there is a place for a bird-like beak and spaces for blood vessels and nerves in the bones of the jaws that suggest one was present. Just having a beak of course does not exactly make it an herbivore (as any modern eagle or vulture) but it certainly shares this feature and its general morphology with those dinosaurs we do know are herbivores like ceratopsians and ankylosaurs. Secondly, although derived ceratosaurs often reduced the hand to quite amazing degrees, the more basal forms kept ‘normal’ theropod hands with big predatory claws and thus it is therefore probably significant that Limusaurus as the most basal ceratosaur has a reduced had with no big unguals. Again, hardly absolute but it points in the same direction. Finally inside both specimens of Limusaurus (yes there are two specimens for those not paying attention at the back) there is a patch of gastroliths (literally ‘stomach stones’) such as are seen in animals like Caudipteryx. You don’t need anything to mash up soft and easily digested meat in your guts but if you have no teeth or mechanism to chew up touch plants this would be pretty handy. The presence of gastroliths therefore also points towards a herbivorous lifestyle. Limusaurus was then, if not a true herbivore, it had a strong bias towards herbivory as part of an omnivorous diet. It is certainly hard to argue that it was a predator in the manner of its close relatives. The implications of this are themselves interesting. First of all it means that a basal member of a basal clade of theropods adopted herbivory far earlier than we thought. Limusaurus may itself be Middle Jurassic in age, but one must assume that there were herbivorous and / or omnivorous ancestors going back potentially much further in their evolutionary history. The other herbivorous / omnivorous theropods appear much later both in temporal and phylogenetic positions. This suggests (to me at least) that becoming herbivorous might be ‘easier’ then we imagined even for theropods (since ancestral dinosaurs were carnivorous, the sauropodomorphs and ornithischians at least have evolved herbivory). 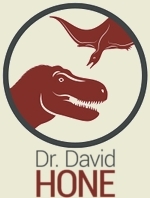 We now have several lineages of theropods that independently acquired herbivory and it happened much earlier than we thought, and in a clade we would not have expected to see it in – who knows, there might even be an herbivorous allosaur or tyrannosaur out there. This also makes the evolution of the ceratosaurs more interesting with an herbivore in their ranks. First off, Limusaurus is recovered in our analysis as the sister-taxon to the little known Elaphrosaurus from the Late Jurassic of eastern Africa. This implies that this animal itself may also have been herbivorous if it is such a close relative. Enticingly, Elaphrosaurus, while known from a pretty complete skeleton has no skull preserved so this is certainly a possibility. Oli Rauhut is working on a big new description of this taxon and there are potentially indicators in the skeleton that can reveal a tendency for herbivory or carnivory so there is mo re to come on this issue at least. Secondly, Limusaurus and Elaphrosaurus as a pair are the basal most ceratosaurs, and with the taxa basal to them (other theropods) and more derived than them (other ceratorsaurs) all being predatory, what does this mean for the evolution of herbivory? It’s tempting to reason that perhaps early ceratosaurs shifted from carnivory to herbivory and later ones revered to carnivory. However, it is of course more parsimonious to think that this is simply a single change to herbivroy in one lineage than two independent reversals (and of course such complex issues as the reacquisition of teeth, the predatory manus and so on). Still, when we see a general conservatism of diets in other theropod lineages (no matter what they are eating) Limusaurus stands out next to its cousins as a dramatic example of a reversal of lifestyle. Another point here is that Limusaurus looks rather like ornithomimosaurs, oviraptorosaurs and modern ostriches in terms of the general body plan. For that matter it looks rather like Effigia, the crocodilian ‘ornithomimid’-mimic that was described a few years back. It’s not a great piece of evidence admittedly, but it does seem to be a nother case of convergent evolution towards a constrained bauplan for archosaurian herbivores. In fact it’s worth pointing out that Elaphrosaurus at some point was mistaken for an ornithomimosaur, adding fuel to the fire that this may be an herbivore too and adding weight to the idea that it’s a close relative of Limusaurus. So there we are, an herbivorous Middle Jurassic ceratosaur. We never expected to find it, and there it is. What other surprises yet lie in wait? I’m really not sure I might want to guess. There is still lots more to talk about with Limusaurus however so come back for the (possibly) exciting, and certainly complex and confusing issues of finger homology and the rise of birds (via ceratosaurs). Xu, X., Clark, J.M., Mo, J., Choiniere, J., Forster, C.A., Erickson, G.M., Hone, D.W.E., Sullivan, C., Eberth, D.A., Nesbitt, S. Zhao, Q., Hernandez, R. Jia, C., Han, F., & Guo, Y. 2009. A Jurassic ceratosaur from China helps clarify avian digital homologies. Nature 459(18):940-944. I have just read Xu et al. 2009, and I am a bit baffled that not a single synapomorphy is mentioned to justify inclusion of Limusaurus in Ceratosauria! The descriptive and comparative section is so brief, it is not even clear why Limusaurus is apparently considered a theropod a priori, without really addressing the possibility of it being a derived shuvosaurid (though I agree it probably is a theropod). Well that is nature for you, you only get a limited amount of space in the main text and when you have to inlcude herbivory and homologies in there too you run out of room fast. However the online supplementary material is most extensive and covers this is some detail. Congrats on co-authorship, and on a very neat post! As a layman dinophile, I’m most interested in the repeated rise of omnivory and herbivory among maniraptoriformes…make that theropods in general now). Given this new taxa, omnivorous-to-herbivorous tendencies running strong throughout maniraptoriformes, and Eoraptor looking like an omnivore, it seems plausible now that the basal state of theropoda was at least facultative omnivorory – a diet closer to canids than to the felid-style hypercarnivory which is normally assumed. One thing you didn’t mention in post, which I know is discussed in your paper (I haven’t seen the paper itself, but the supplementary info) is that Elaphrosaurus may not be the only relative – Spinostropheus and possibly even Deltadromeus may well be sister taxa as well. Add to this a number of very poorly known basal ceratosaurs like Chuandongocoelurus, Bahariasaurus, and Ozraptor, and there may be the makings of a pretty widely-distributed clade ranging from the Middle Jurassic to the Early Cretaceous. Who knows, maybe some of the extremely fragmentary “noasaurs” or “basal abelisauroids” will also find their position revised in new cladistic studies as well. As for gastroliths = herbivory, I would like to point out that extant crocodylians employ gastroliths for digestion (and not just for ballast, as is often presumed). Muscle and sinew are certainly easier to digest than cellulose encased plant matter, but as anyone who has had a good steak can tell you, tenderized meat goes down much easier. Plus, it would also help with the pulverization of bone. True, but the beak and other features do imply herbivory, and certainly crocs employ relatively large stones (as I understand) compared to these very small gravelly ones. Very basic evolution question: I seem to have read about many cases of carnivorous animals tending towards herbivory while very few of the reverse. Is that an accurate perception? I guess it makes sense that more speciation niches open up by going down the food chain rather than going up it. Does this also suggest that obligate carnivores always are derived from omnivores, rather than a progression from herbivory to carnivory in a relatively short time? Anyway, congrats on the great work! I think that is an accurate perception Brian and probably comes from that fact that primitively, most tetrapods were carnivores (well meat-eaters of some kind, be it fish or insects or whatever). Most fish eat other fish, or at least animalian life of some kind, as do most amphibians and reptiles. Thus conversion to herbivory from carnivory is the norm and the reverse is quite rare (and generally via omnivory, which makes a lot of sense intuitively). Wait, Spinostropheus and Deltadromeus are ceratosaurs?! When did this happen? I thought they were megalosaurs! Great write-up, and I love this new taxon. I’m more interested in the animal’s bizarre anatomy than what its fingers say about frame shifts. I mean, you’ve got an Effigia-like ceratosaur with a fused sternal plate and probably simple feathers (thanks to Tianyulong!). And it’s related to Ceratosaurus. I love it! Well, Spinostropheus was described as a ceratosaur. As for Deltadromeus, Longrich (DML, 2000) was the first to propose the possibility, but Carrano and Sampson (2002) and Sereno et al. (2002) were the first to in print (both in SVP abstracts). Wilson et al. (2003) performed the first published phylogenetic analysis which found this result, but being a Sereno analysis, it didn’t really allow for alternative placements. Carrano and Sampson’s (2008) analysis was ceratosaur-centric, so the Limusaurus analysis may be the first to actually test if Deltadromeus is a coelurosaur and recover it as a ceratosaur. Wilson, Sereno, Srivastava, Bhatt, Khosla and Sahni, 2003. A new abelisaurid (Dinosauria, Theropoda) from the Lameta Formation (Cretaceous, Maastrichtian) of India. Contr. Mus. Palaeont. Univ. Mich. 31, 1-42. I wasn’t aware Deltadromeus was ever considered a megalosaur. It was first thought of as a giant basal coelurosaur. Now it’s thought of as either a noasaur, or a basal ceratosaur, with most trees now suggesting the latter. Interesting aside, we have no remains of the arms of Spinostropheus at all, of Elaphrosaurus below the humerus, and of Deltadromeus below the forearm. So not only the toothy skulls, but the typical theropod hands these taxa are given in reconstruction are all quite possibly very wrong. There is no positive evidence of predatory habits from any of these taxa – except maybe the feet of Deltadromeus, I have no idea what the shape of the unguals on the feet were. _Deltadromeus_ may be the same as _Bahariasaurus_, which was once considered some kind of carnosaur/’megalosaur’. _Baryonyx_ _Lourinhanosaurus_, _Poekilopleuron_ and _Nqwebasaurus_ also had gastroliths. So to take up Jura’s point, is the presence of gastroliths a reliable indicator of a herbivorous diet? Or else, maybe these guys were omnivores? In the case of _Baryonyx_ (which appears to have been semi-aquatic) the gastroliths may have aided in ballast. How big was this animal? Nothing I’ve read seems to mention that. There’s a scale bar in the figure at the top of this post, but it’s not labeled. Sorry I deleted them from the images (I can’t think why now). It’s small – Caudipteryx sizes, say 2m ish with a tail. Just checked the actual paper (like, duh) and it says 1.7 m, so I was pretty much bang on. I believe Baryonyx has never been found with gastroliths in its gut content. Am I wrong ? If Eshanosaurus is an Early Jurassic therinosauroid as some of the authors on the Limusaurus paper contend, then this taxon is actually the earliest theropod herbivore. A point conveniently overlooked when writing the Limusaurus paper? 😉 Just teasing. As for gastroliths, it’s worth noting that we know nothing about the cranial morphology of most of the taxa mentioned and in the case of Baryonyx, there were only a couple of pebble associated with the skeleton, that may or may not be gastroliths. Speaking for Paul and having had a conversation over this very taxon a while back I think he just might. Not that I am trying to establish either a) Paul’s position, or b) his wagering skills vis-a-vis his property without his consent. I would like to point out that extant crocodylians employ gastroliths for digestion (and not just for ballast, as is often presumed). At the SVP meeting last year, an X-ray movie was shown that showed gastroliths lying around in an alligator stomach and doing nothing while an entire rat was being digested. Geez David,, was this not just run around on the DML. Like others, my evidence for a muscular gizzard comes from Bakker’s Heresies. Bakker is, admittedly, prone to romanticisms, so it is possible that he didn’t see what he described (and it certainly wouldn’t be the first mistake found in Heresies). However, there are other studies that suggest that the role of gastroliths is a digestive one. I find the issue of ballast in crocodylians to be suspect both because of the association of the aforementioned behaviour, with feeding, and because stomach stones contribute very little to overall body weight. Brazaitis (1969) observed stomach contents of captive crocodylians, and reviewed gastrolith studies in wild crocs. In all cases, stomach stones made up ~1% of total body mass. It’s hard for me to imagine that 1% being so integral. Brazaitis, P. 1969. The Occurrence and Ingestion of Gastroliths in Two Captive Crocodilians. Herpetologica 25(1):63-64.